Who will win the fight between Deathstalker and Black Widow? When it comes to venom severity, the Deathstalker and Black Widow come up as some of the most venomous species in Kingdom Animalia. The venom in this two creatures is a subject of many scientific studies as it contains poisonous substances that sometime result in fatalities. A sting from the scorpion or a bite from the spider is not necessarily fatal but it has a number of effects on humans and other animals. There are between 1700 and 2000 species of scorpions but the deathstalker is considered as one of the most dangerous ones. The venom in deathstalker is a combination of various neurotoxins (known to impair the nervous system) and cardio-toxins (result in cardiovascular conditions). Deathstalker venom contains dangerous chemicals including Scyllatoxin, charybdotoxin, Agitoxins and Chlorotoxin. All these chemicals are hazardous and in large doses, they result in death. 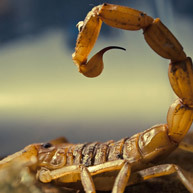 In most cases, a sting from this scorpion is not fatal because they have low doses of the venom that gets neutralized before causing significant harm or death. The severity of a sting from the deathstalker depends on a number of factors. This include the age and health of the person stung. For most healthy adults, a sting from deathstalker is normally not fatal. However, it may result in death if the person is allergic to some agents or if the person has conditions such as heart problems. There are also high instances of death for children and elderly people stung by this creature. The black widow is also one of the most feared arachnids. Just like the deathstalker, a black widow bite is not fatal in most cases. However, it is lethal for people with certain medical conditions. Recent scientific studies have shown that contrary to popular belief, the black widows do not always eat their mating partners. They rarely do so and only eat their male partners under constrained conditions. One of the most aggressive scorpion species. Yellow in color with different tinges of yellow. Smaller than other species of scorpions. Pincers and legs are thin and more agile than other scorpions. This feature makes them move faster than an average scorpion. Due to their small size, they require and have potent venom that quickly immobilizes and kills their prey instantly. Can grow to 30-77 millimeters (1.2–3.0 in) long with the average size being 58mm (2.3 in) long. Female deathstalkers are normally larger than male ones. A female one can grow to 100millimeters but male ones grow to a maximum of 70 millimeters. Maximum weight is 2.5 grams. Mostly found in deserts and hot and dry areas with predominant vegetation being shrubs. Geographical regions where these species can be found include North Africa, Middle East and other regions. Countries having deathstalker species include Mali, Algeria, Egypt, Saudi Arabia, India, Ethiopia, Kazakhstan, Israel, Qatar, Libya, Afghanistan, Niger, Somalia, UAE, Turkey, Kuwait, Oman, Sudan, Yemen, Iran and Syria. A deathstalker scorpion sting is normally handled as a medical emergency and heavy antivenom doses are used to neutralize it. Scientific studies have shown that venom extracted from this species can possibly treat brain tumors and diabetes (insulin regulation). In most jurisdictions, it is illegal to own or keep this scorpion. This is applicable as a general rule except for licensed zoos and research organizations. In some jurisdictions, there are no laws to govern the keeping of deathstalker scorpions. Are cannibalistic in nature i.e. they eat their own species when extremely hungry and there is no other prey to feed on. They feed mainly on other small insects including centipedes, other scorpions, spiders, worms, crickets, grasshoppers etc. Are nocturnal i.e. prey at night. Have hairy legs that sense nearby vibrations from potential prey. Known to use their colors to camouflage with their surrounding when on hunting missions. When hunting, they normally pounce on their potential prey before using their pincers to weaken the prey. Gestation period is between 122 and 127 days. Depending on the size of the female scorpion, they normally reproduce between 12 and 87 scorpions in each gestation period. An average female deathstalker reproduces about 62 scorpions each cycle. Also referred to as the shoe-button spider, Black widow spider, Comb-footed spider, Hourglass spider, tangle-web spider, widow spider, gumfoot-web spider or cobweb spider. Are generally timid and not aggressive though they sometimes bite when rattled or feeling threatened. Are cannibalistic in nature i.e. they sometimes eat their own species. The name ‘black widow’ originates from their cannibalistic tendencies i.e. 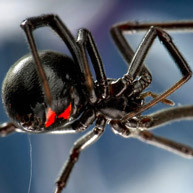 female black widows sometimes eat their male counterparts immediately after mating. Have striking resemblance to other members of the genus Latrodectus including the western black widow spider, the northern black widow spider, brown widow and red widow. Even though there are other ‘black widows’ within that genus, the term is used mainly to refer to the Southern Black Widow. Compared to their body size, their legs are quite long. Primary colors that characterize this species include Orange, red, black, white and brown. Females are mainly black with red and orange patches. Juvenile Southern Black widows are normally grayish in color with orange and yellow spots. Male spiders are normally black with some of them having red marks at the abdomen. Countries where they are likely to be found include some states in the Unites States of America, some Canadian provinces and the whole of Dominican Republic. After mating and egg fertilization, the eggs are enclosed in a globular silken material and then placed in a hidden and well camouflaged area. Eggs hatch after 20-30 days. Each summer, female widow spiders normally lay hundreds or sometimes thousands of eggs. However, less than a hundred eggs normally survive. On average, out of all the eggs, only 30 juveniles will be hatched. It takes between 6 and 9 months for black widows to fully mature. Lifespan for females is about 3 years while male ones can live for up to 4 years. Apart from eating other spiders, the black widow also feeds on insects such as millipedes, lice, centipedes and other members of the class arachnids. Only female southern black widows are capable of envenoming human beings. The male and juvenile widows have a smaller chelicerae and therefore making it hard for them to inject any venom to a human being. The widow’s venom contains neurotoxins that result in extreme pain, sweating, vomiting, muscle rigidity, headache and nausea. Chemical components of its neurotoxic venom include Latrotoxins, Inosine, Guanosine and Adenosines. Though not fatal to a healthy adult human being, the venom is lethal for smaller animals including cats. Even though professional medical care is highly recommended for widow bites, their venom gradually wears off from the human body and the symptoms will disappear even without treatment. There is an antivenom developed for this species but it is rarely used. A combination of painkillers, calcium gluconate and muscle relaxers is enough to neutralize its symptoms. As part of his studies and research, renowned scientist Allan Blair (1900–1948) once allowed a southern black widow spider to bite him. Habitat They generally reside under rocks or in abandoned burrows of other animals. Black widow spiders are found in the warm, dry parts of the world and prefer to spin their webs in dark, sheltered spots close to the ground. Venom The sting from the Deathstalker Scorpion is painful but few people die from it The female black widow has unusually large venom glands and her bite can be particularly harmful to humans. 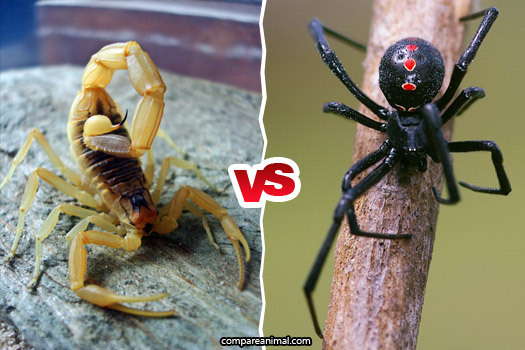 Both the deathstalker scorpion and southern black widow spider belong to class Arachnida but they have totally different physical and behavioral characteristics. It would be interesting to watch a fight between the Southern Black Widow and deathstalker. 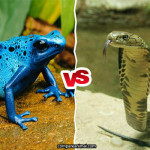 One of the two will definitely win and the outcome will be determined by not only their venom but also their physical characteristics, agility, stamina, speed and skills. 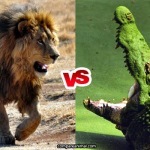 A battle between these two species will be an epic one as the losing one may end up being fed on by the winner. 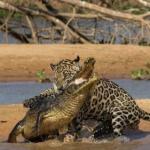 Survival instincts will play a significant role in this fight as each one of them tries to hold on to life. It may be difficult to predict the winner but based on a survey in compareanimal.com most people believe the deathstalker will emerge as the winner. 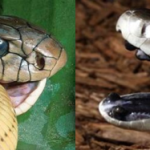 Comparisons of the other venomous creatures. The first scorpions were alive millions of years before the spider in the Silurian period and was adapted to survive the harmful UV rays of the sun and also is the ANCESTOR of the first spiders. So naturally the Black Widow would most likely break her fangs trying to pierce the scorpion’s armor and STILL not pierce it. A prime pride boss male lion would destroy both of them..